Unrest in Bosnia is a sign that people are losing patience with problems that have remained unresolved since the signing of the Dayton Agreement at the end of the civil war in 1995. The protesters did not use any weapons and, though several buildings were set on fire, they behaved reasonably well. There will be no return to war. We should, however, expect further turmoil in Bosnia-Herzegovina and possibly a deterioration in the western Balkans as a whole. Why did the frustrations of Bosnian Muslim youth erupt in February? We have to understand that the international community is partly responsible for events there, however much governments may want to wash their hands of what seems like an old problem. The international community still has a big say in domestic politics under an arrangement designed to preserve the status quo between the Bosnian Muslims, Serbs and Croats: the International Monetary Fund selected the governor of the central bank; the President of the European Court of Human Rights chose a third of the judges of the Constitutional Court; and the Office of the High Representative, an institution created at Dayton, is by law the most powerful in the land. Unfortunately, Bosnia-Herzegovina is an increasingly dysfunctional state. This is the result of the complex set-up inherited from Dayton: too many state organizations at cantonal level and two major entities with different constitutions -- the Federation and the Republica Srpska. Meanwhile the High Representative is generally incapable of functioning due to lack of political agreement between Brussels, the European nations and the United States. At the same time, the international armed presence in the country has been reduced almost to zero, which should send a signal that it is time for the Bosnian leadership and institutions to take political ownership. Against this background -- and with unemployment at 45 per cent -- it should be no surprise that a new generation of Bosnians has taken to the streets to fight for its future. The Bosnian scholar, Neven Andjelic, describes what he calls direct democracy taking shape in Bosnia. The first task is for the Western powers to accept their responsibility before it is too late. They must unite to make the state function and give it the capacity to govern. Europe and the United States need to reach a consensus on what needs to be done. For this to work, Russia and Turkey also need to be included. Specifically, the representatives of the international community need to take democratic institutions seriously and avoid backroom deals with partly corrupt and autocratic party leaders. They need to talk to parliament. Germany in particular has lost focus on Bosnia-Herzegovina and has spent years urging the international community to close the Office of the High Representative. If this happened, there would be no legal way to intervene, even if the country were on the verge of a new war. If nothing is done soon, and with the conflict between Kosovo and Serbia and the quarrels between the two entities of Bosnia-Herzegovina still unresolved, the western Balkans will become a black hole. 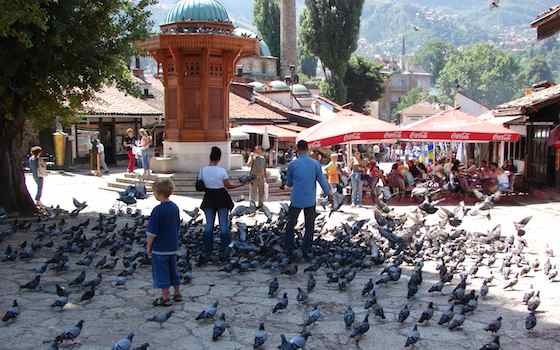 The inability of the state of Bosnia-Herzegovina to function has not even been recognized as a real danger, despite all the warnings from international politicians, think-tanks and NGOs. Events in Ukraine have complicated the situation in eastern Europe and may bring it very close to a cold war. The lesson of recent events is that the deterioration in Ukraine and in the Balkan states could have been avoided if the past three years had been used to address these difficult questions in a permanent dialogue with all partners of the Balkans. The European Union must be more sensitive to Russia, but determined to maintain the principles of international law. Because of the dramatic events in Ukraine, the balance now has to shift to the defence of these principles. In parallel, however, we have to make every effort to restore trust among all the partners. There is no excuse now to forget Bosnia-Herzegovina because it is small and in some eyes unimportant. That would be a terrible mistake. Without outside help Bosnia-Herzegovina can hardly succeed in establishing itself as a stable multi-ethnic state. "We Cannot Afford to Forget Bosnia"